Premiere for the AT. 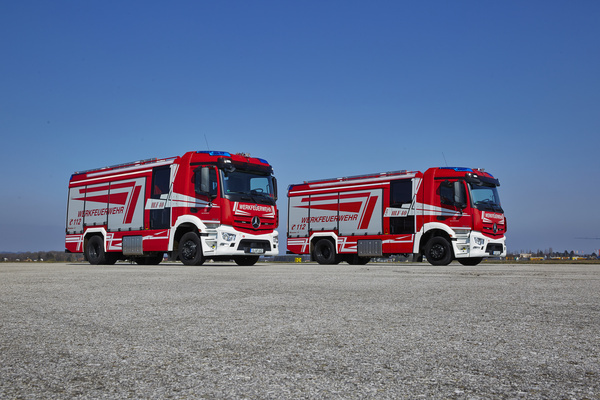 The first of Rosenbauer’s premium class firefighting trucks have been implemented on the new Antos chassis from Mercedes-Benz. The vehicles will go to Daimler AG and join the operations of the Stuttgart-Untertürkheim and Sindelfingen plant fire departments. The AT not only complies with the standard for German rescue assistance vehicles, but has firefighting equipment and technology which also significantly exceeds the requirements. For example, the extinguisher pump outputs at up to 4,500 l/min. Thus, the vehicles have twice the extinguishing power when compared to an HLF 20. The extinguishing agent tanks, with 2,500 liters of water and 200 liters of foam compound, have slightly larger dimensions than standard vehicles. For the generation of foam, an electrically driven and electronically controlled additive pressure proportioning system with a great degree of spread is available. On the one hand, it delivers up to 42 l/min of foam compound for standard foam operations and, on the other, achieves a minimum proportioning quantity of 0.1 l/min for wetting agent operations. The proportioning ratio can be continuously adjusted between 0.1% and 6%. The firefighting equipment is controlled electronically via displays. The vehicles are also equipped with roof-mounted water/foam turrets, which can output up to 3,000 l/min of water at a throw range of up to 70 m. The turret is operated manually and can be fixed on both rotational and lateral axes. The entire lighting technology – from the equipment compartment and crew cab, the scene lighting, right through to the maneuverable floodlights on the mirrors – uses LEDs. An LED light mast is integrated into the body, and an LED traffic warning device is fitted in the rear trim panel. For power generation independent of the vehicle, a portable 14 kVA generator is mounted in the body. On/off warning lights, flashing lights and vehicle lights are shown on a display in the driver’s cab, via this, the power generator is remotely started and monitored, the firefighting pump is activated, and other functions or engine data can be called up. Loading of the vehicles is as for the HLF 20, with extensive equipment for firefighting and technical rescue operations in accordance with DIN 14530-27. They feature a cable winch, CAFS system, integrated generator and ladder lowering device. 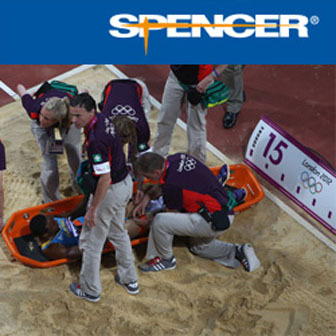 Moreover, they have a permissible total weight of 18 t of additional load capacity, which the plant fire departments can use for carrying specific special equipment. The AT is built on the Mercedes-Benz Antos, which was first presented in September 2012. The Antos is equipped with six-cylinder common-rail diesel engines, as standard, which, with exhaust gas recirculation (EGR), an SCR system (Selective Catalytic Reduction), and an oxidation catalyst and diesel particulate filter achieves Euro 6 standards. The engines in the vehicles of the Daimler plant fire departments provide 315 kW (428 hp) at 1,800 l/min, with the power being transmitted through a fully automatic Powershift gear box with 12 gears. The Antos is manufactured at the Wörth plant, where all Mercedes-Benz trucks in the Actros, Axor, Atego and Antos model series are created on the same production line. This is also the case for the Rosenbauer AT, which is produced in all its many variations on the same assembly line in Leonding Plant II. The first Rosenbauer ATs, based on the Antos, will be go into operation in the plant fire department of their parent plant in Stuttgart-Untertürkheim, where Daimler AG manufactures engines, gear boxes, axles and related components, as well as at the Sindelfingen plant, where seven premium and luxury class Mercedes-Benz models are produced.